“Drift like there is no tomorrow” – this motto addresses motor racing fans, adrenaline junkies, car enthusiasts and today’s modern men with an intense passion for speed. The tradition of more than 130 years in combination with progressive design and technology are merged with distinctive sportiness and maximum comfort, which carries a very specific way of life – a life on the fast lane. 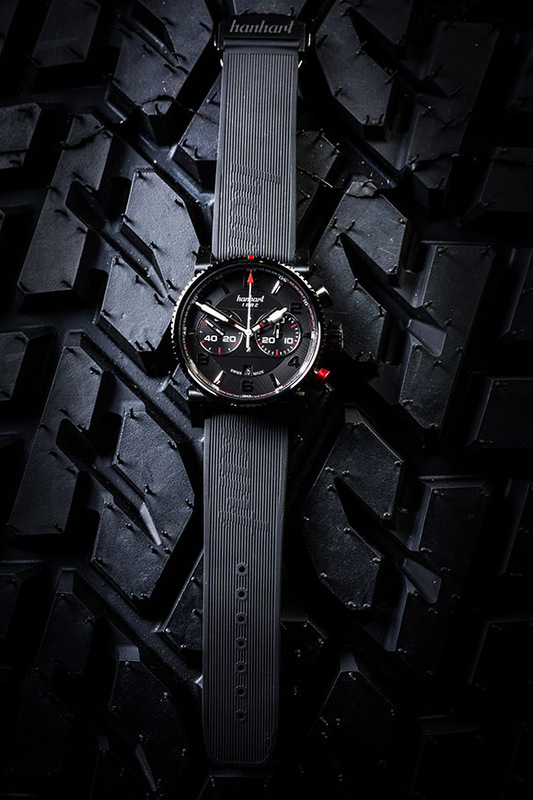 The PRIMUS Racer aims at all-time top performers and motor sport fanatics, who love a dynamic lifestyle or extraordinary experiences and put a high value on functionality, quality and contemporary aesthetics. 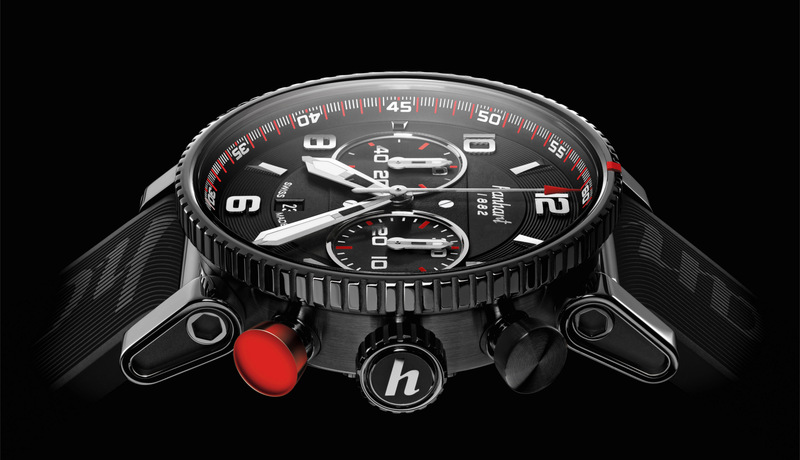 The dark design of a black DLC coated (diamond-like carbon) stainless steel, the black dial with polished, applied Arabic numerals and index marks as well as the black vulcanized rubber strap were deliberately chosen to make the striking Hanhart details stand on their own: the distinctive fluted bezel, the eye-catching red markings and not least the anodized aluminium red button. 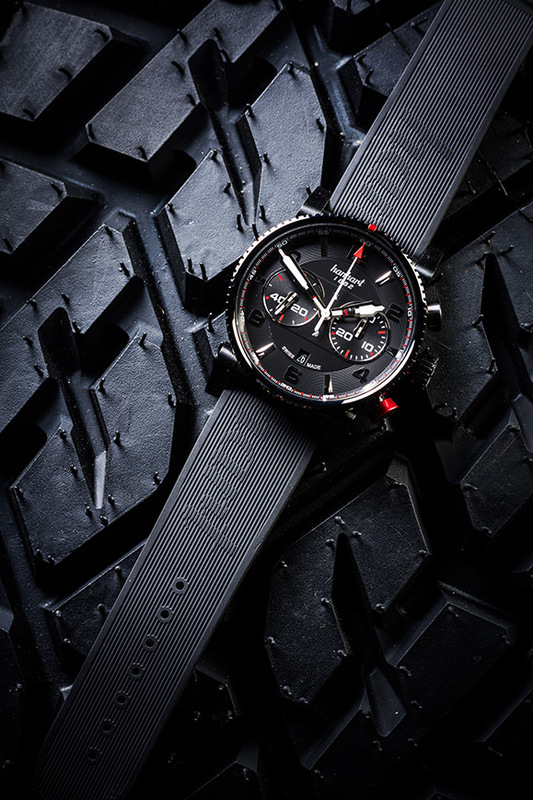 All of this embody a dynamic and life-affirming sporty look, which highlights the PRIMUS Racer Dark amongst the PRIMUS Racer collection in its own energetic way. However it’s timeless casual and ensures a maximum comfort on the wrist thanks to its flexible lugs and the pliable rubber strap. One of Hanhart’s major claims is to offer maximum wearing comfort. Therefore the PRIMUS models feature flexibly screwed lugs with an angle of 45°-50°. 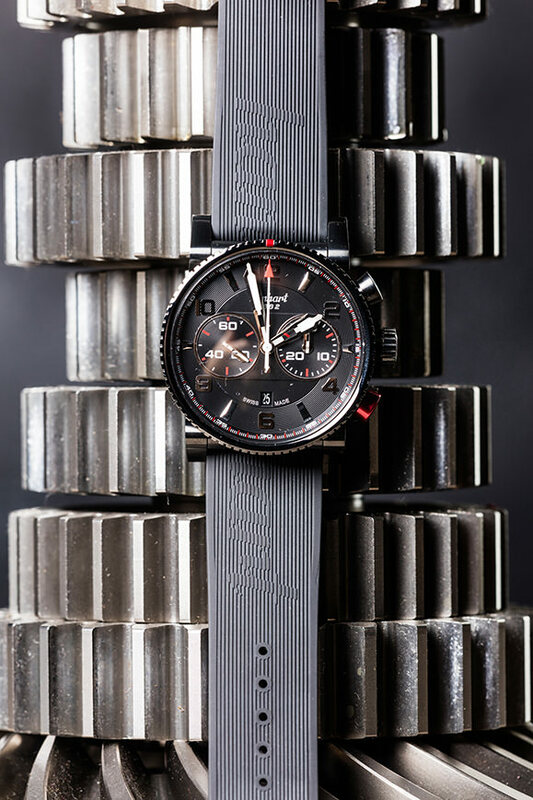 They are integrated into the vulcanised rubber or calfskin strap and swing perfectly on all wrist sizes. 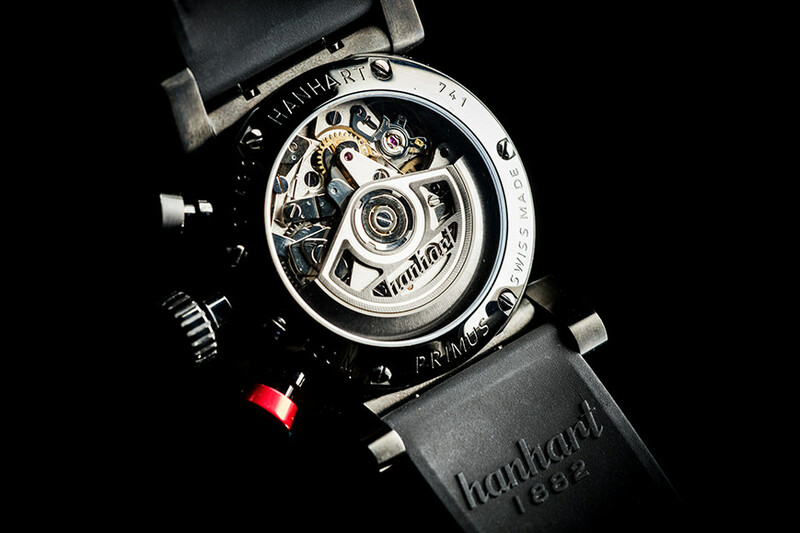 A sapphire crystal glass on the screwed back of the case reveals the fascinating mechanism of the automatic movement, which features a rotor with a skeletonised Hanhart logo. Besides the captivating view of the valuable interior the internally anti-reflective sapphire glass still provides an excellent protection to the movement. At Hanhart, form and function are often closely intertwined. 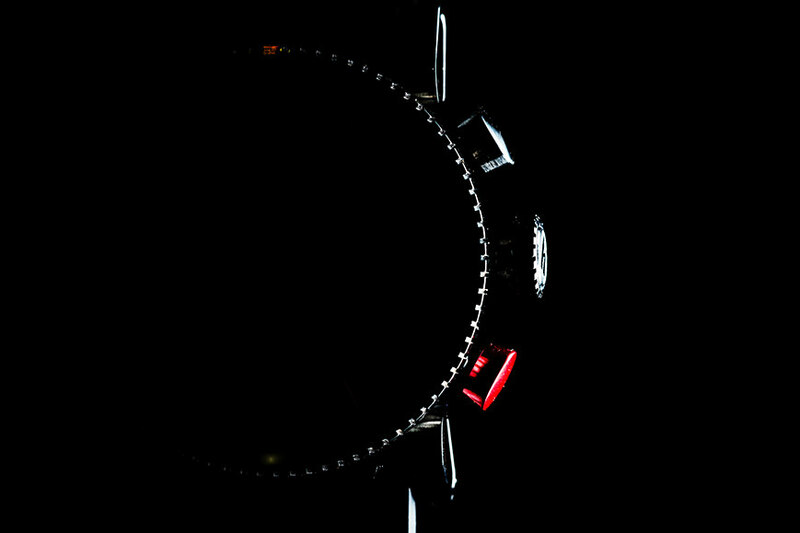 This is particularly true of the bezel, an essential component in the distinctive visual identity of Hanhart watches. Bezels in a wide variety of forms, fixed or rotatable, have been introduced in Gütenbach over the years. 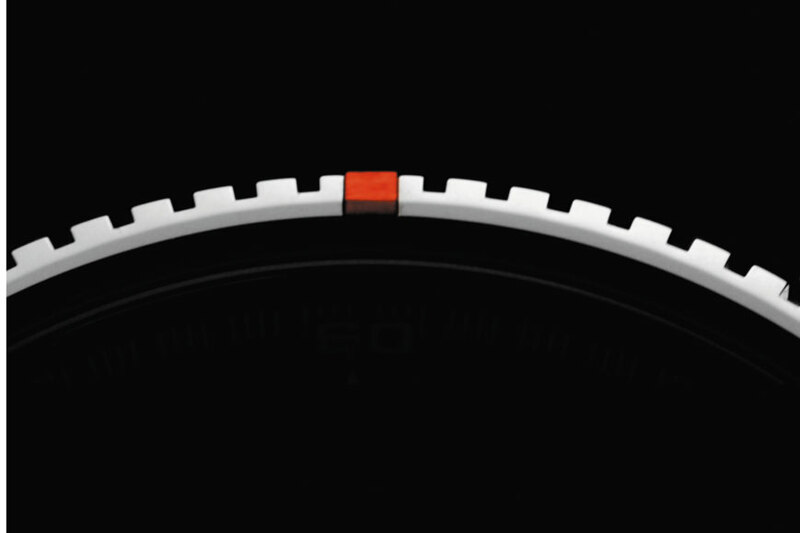 Originally, the bidirectional fluted bezel with the inlaid red marking had a functional purpose: it allowed measuring lap times and served as navigation while guaranteeing safe and secure handling. 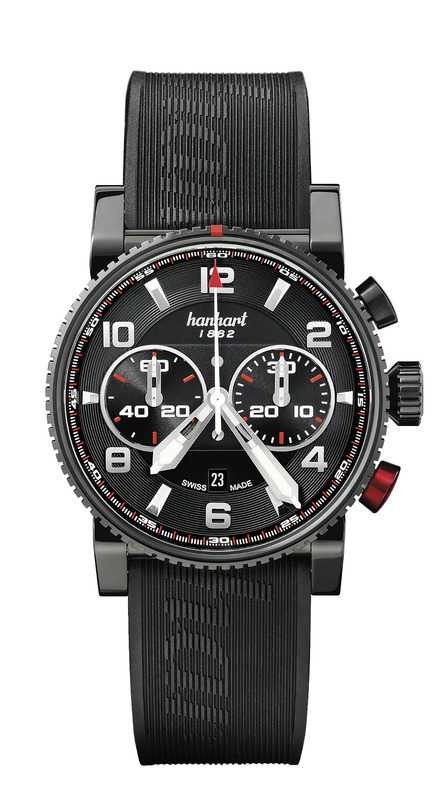 Over time, the striking fluted bezel became an aesthetic element, a genuine Hanhart signature feature. 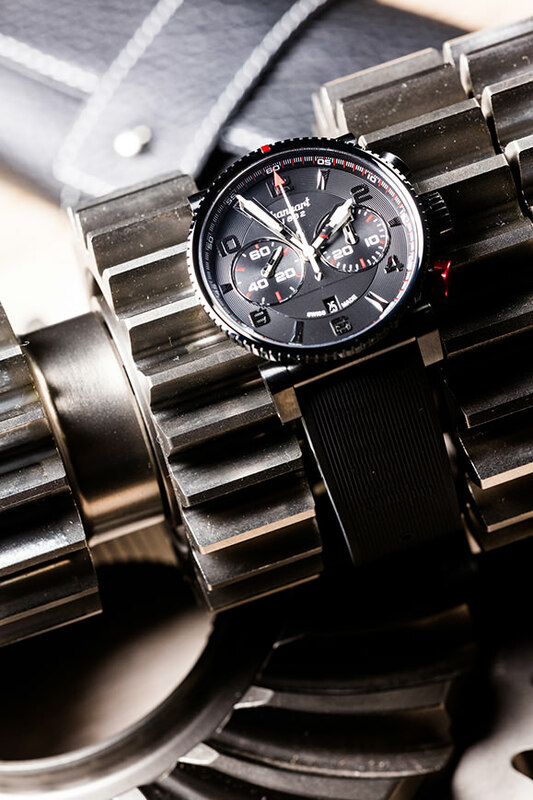 One of the brand’s most distinctive features, the red button, underlines the relationship between Hanhart’s first pilot’s chronographs, its mechanical stopwatches and the new collection. 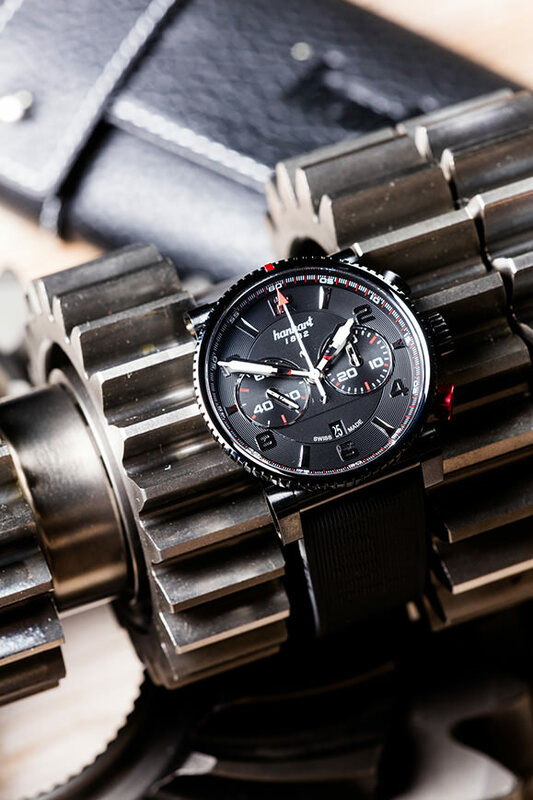 It has been a distinguishing characteristic of Hanhart watches since 1939 and was previously intended to prevent pilots from unintentionally resetting the stop time. For the models featured in the Primus collection it has been finished with anodised aluminium. Our brand values perfection and enthusiasm match perfectly with Florian’s personal principles. He belongs to a new generation of racers who live Hanhart’s values on and off the track. 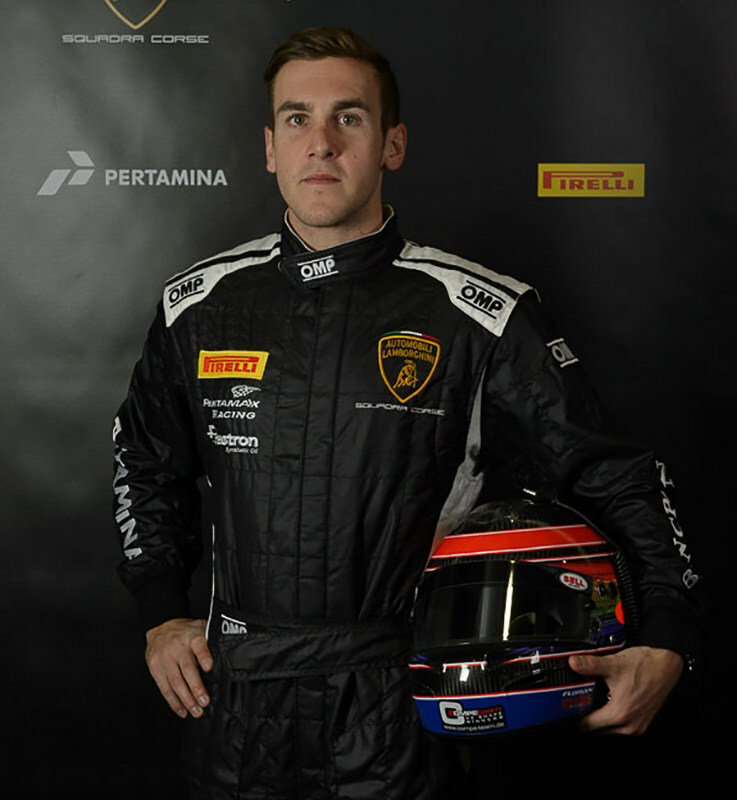 The young racer lives his passion for speed in the world’s fastest one-brand series, the Lamborghini Super Trofeo Europe, from where he goes to his extreme limits, in order to surpass them again and again. 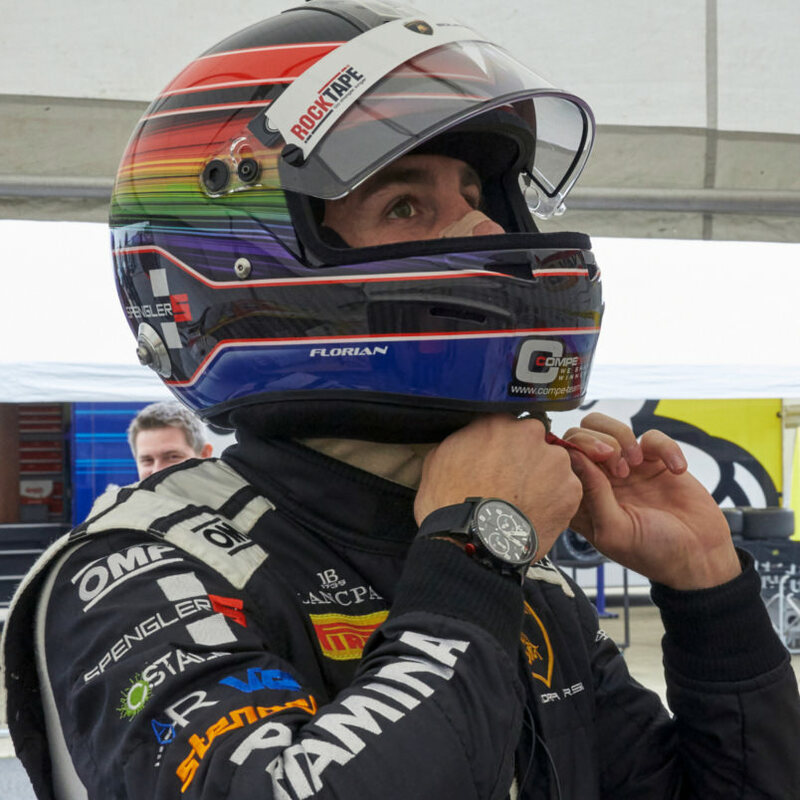 The brand ambassador Florian Spengler appreciates his PRIMUS Racer Dark Hanhart particularly because of the size, grip and comfortable operation. Hanhart is excited to continue accompanying the young racer on the track as well as in everyday life as a strong partner. 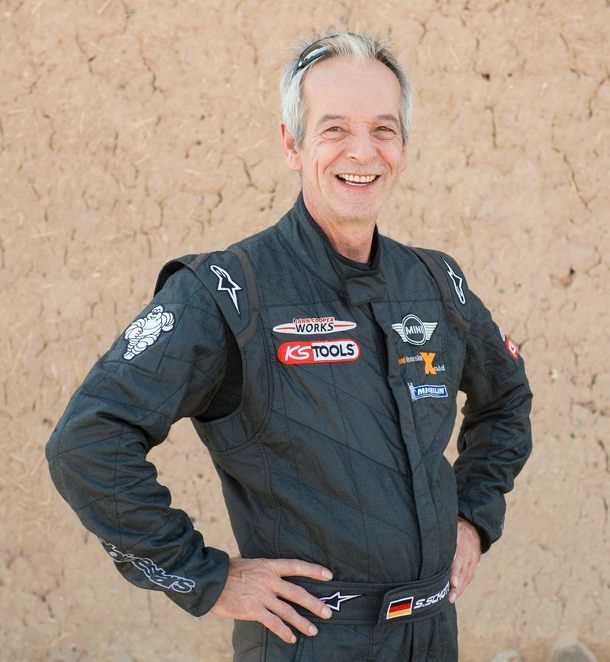 Offroad-Pilot and Hanhart enthusiast Stephan Schott, commonly known as “Mr. Consistency”, has been the only one who has finished seven editions of the Dakar Rally in a row. 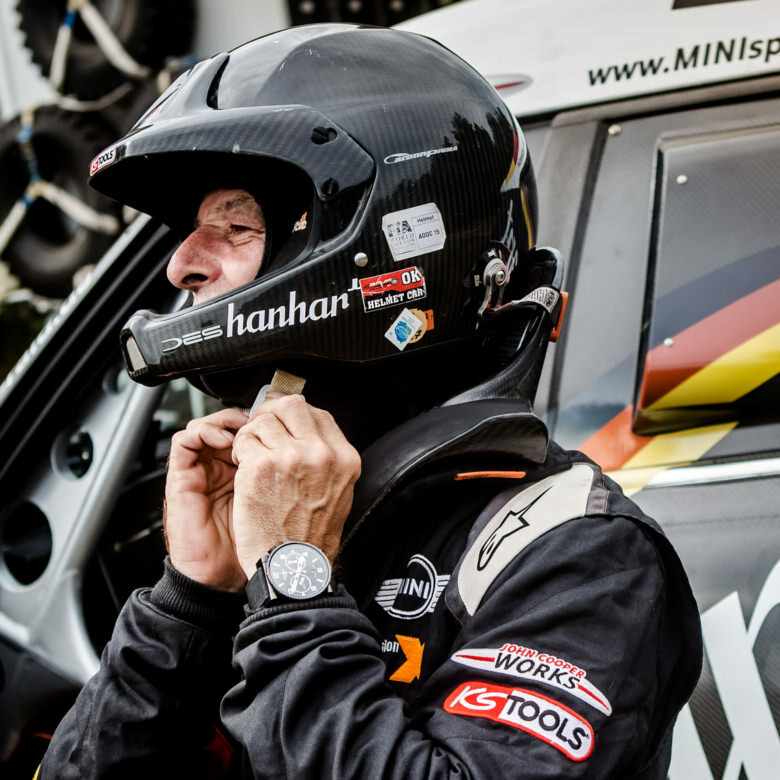 Together with his co-pilot Holm Schmidt he has become a key asset of the X-Raid MINI All4 Racing team. 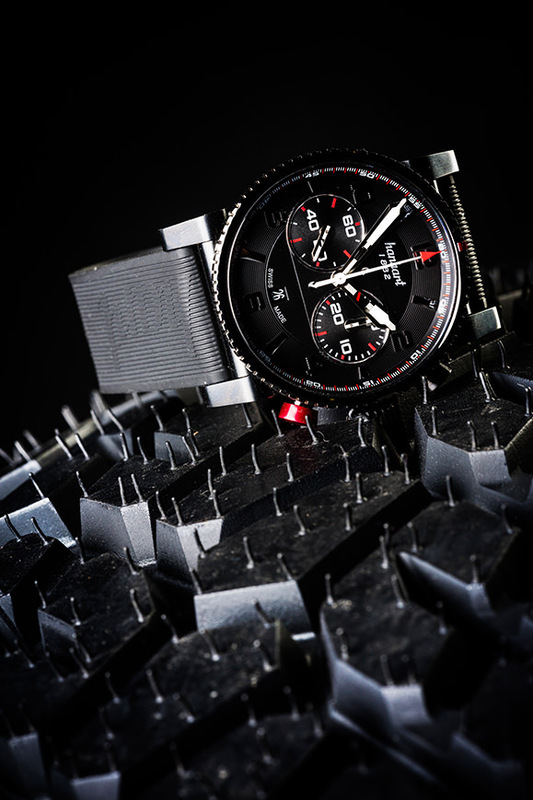 Hanhart is very proud to consider him as a close friend, not just because of his remarkable successes at championships as the Abu Dhabi Desert Challenge, the Baja Poland and of course the world famous Dakar Rally, but also because of his enthusiasm for manufacturing quality and precision technology at the highest level. Stephan Schott shows his ground to thrill his fans with robustness and efficiency at each challenge – just like Hanhart does. Store your Hanhart, whether at home or on the move, in an iconic leather roll. Your watch deserves protection. 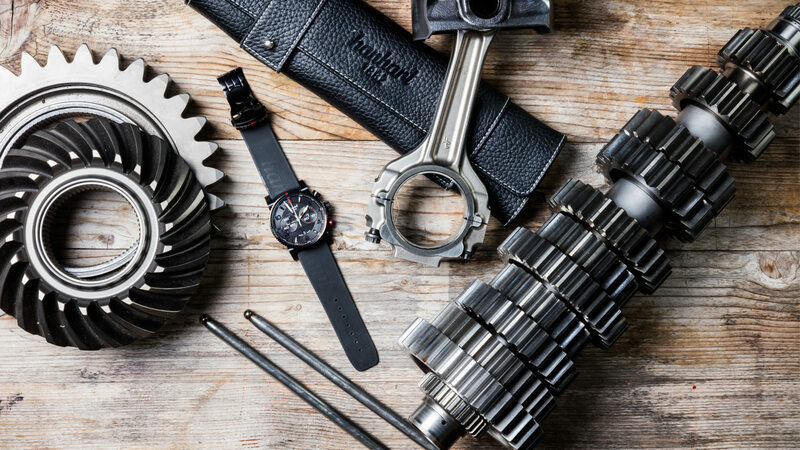 Feel the ruggedness of the leather that gives the Watch Roll its unique Black Forest look and feel of great quality and resistance. The Hanhart Watch Roll has been designed to keep your coveted timepiece also safe during your travels. 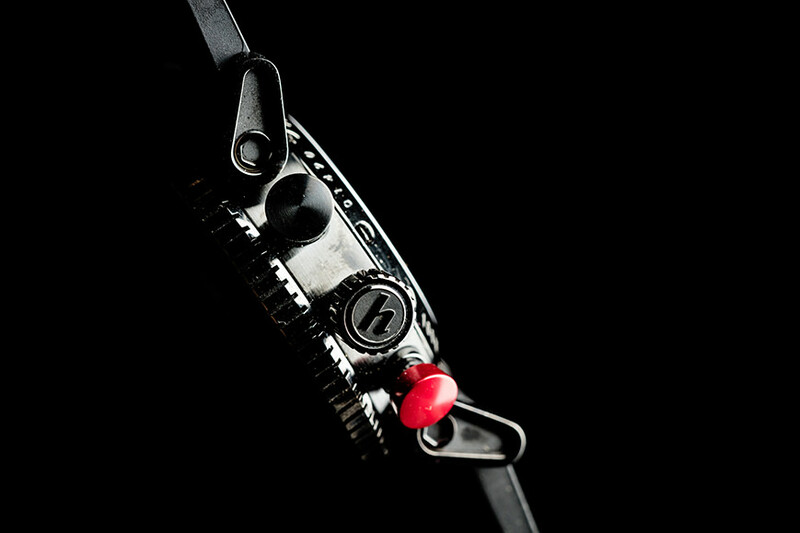 Store your watch by fixing it safely with two snap fasteners. For additional protection, the case’s interior has been expertly lined in ultra-soft leather; the whole is securely held together by two silvery buttons.